You will get our luxuroius casino tables and professional croupiers dressed in Black Tie to deal at the tables and help guide any first time players unfamiliar with casino games. 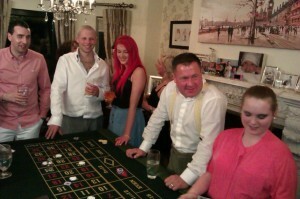 Our large casino tables can fit into most living areas, kitchens and dining rooms. Smaller tables are also available for houses with limited space. Why not have a 007 Bond party? Decorate your room with James Bond cutouts and and make it a fancy dress party! Background music can be included extra to create an ambience to your party and a pa system so you can make speeches and announcements. Led uplighting is included with all our casino packages to set the mood of the casino in any room.